Excel 2016 is one of the best tools available for sorting and recording information- especially when that information is easiest read in spreadsheets or needs any number of calculations performed. 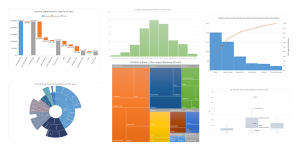 The cells can contain numbers, text, or formulas and can be used to create amazing looking charts. In the most recent release of Microsoft Excel 2016 there were many changes, each designed to make the program easier and more efficient. If you are interested in Microsoft Excel 2013, check out our Excel 2013 Tutorial. The new Excel 2016 has 6 new chart types available, but like in the past, the creation of these charts is not difficult. To access these charts, highlight the database table, select Insert > Recommended Charts and then choose the one that will best suit your needs. 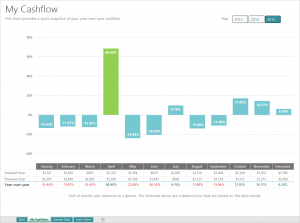 ● Waterfall – This chart is perfect for visualizing financial statements easily so that you can quickly track profits and losses. ● Histogram – These charts allow you explore and analyze distribution of a product or service, which makes it easier to determine how to expand your business. This chart is most frequently used in charting statistics. ● Pareto – Track quality control by being able to sort the frequency of the most prevalent issues perhaps, a bar graph, then show the additive contributions of each via a line graph. ● Box and Whisker – This allows you to bring statistics to distribution of information, including aspects such as range, quality, means and outliers. It can be used to add a visual angle to Excel 2016’s statistical functionality, as it gives a snapshot of your data. ● Tree Map – Used to analyze across a hierarchy in one view. The tree map shows the big picture, so it is easier to draw comparisons between similar or competing products. ● Sunburst – This allows you to show off every level of your hierarchy so that a deeper analysis is possible. The visual layout is circular in shape and can be designed to display any number of levels for any category. The new templates in Excel 2016 come with sample data and charts, as well as exercises where you can learn how to use each template. 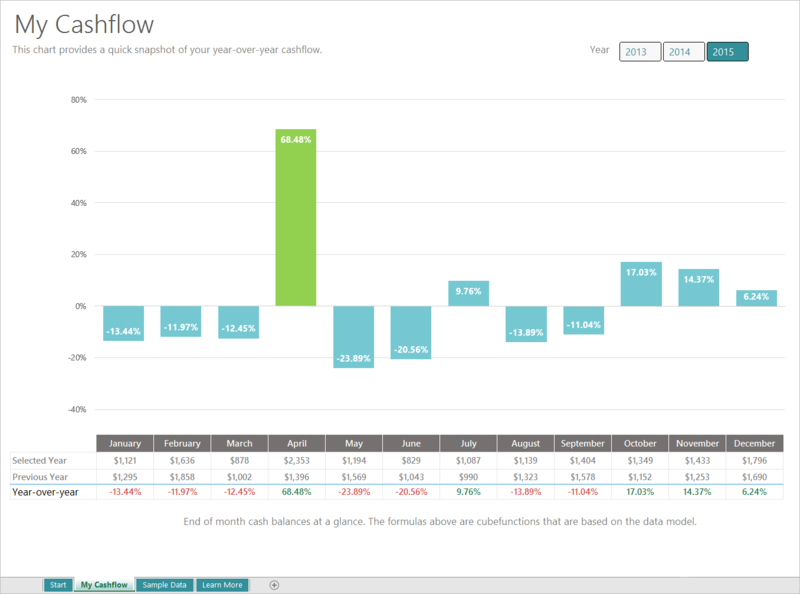 Some of the templates included are My Cashflow, My Calendar and Stock Analysis. Although these are not truly new, they are now a standard feature, rather than an add-on. They allow one to compare and contrast data over a specified amount of time, and show it in a three-dimensional image. You can map the data and then use a feature called Video Tours to see how data changes over time. When you work on a project with a co-worker or perhaps someone who is located off-site, it can be a challenge. However, with the changes to MS Excel 2016, it is possible to share ideas, queries, reports charts, and more by clicking the Share button in the upper right corner. When the share panel opens click Save to the Cloud > Save As screen. Then choose the option that fits your situation. You can then invite people to the document, set permissions and then send the links to the appropriate people. Do you have data to share, but are unsure as to how it will best be presented? Then the Quick Analysis Tool can show several viable options and help you select the best chart for the job. 1. Highlight the cells that contain the data you want to show in a chart. 2. Click the Quick Analysis button. (It is in the bottom right-hand corner of the selection). 3. Click the Charts tab, then move across the recommended charts to see which one will work best for the data, then make your selection. 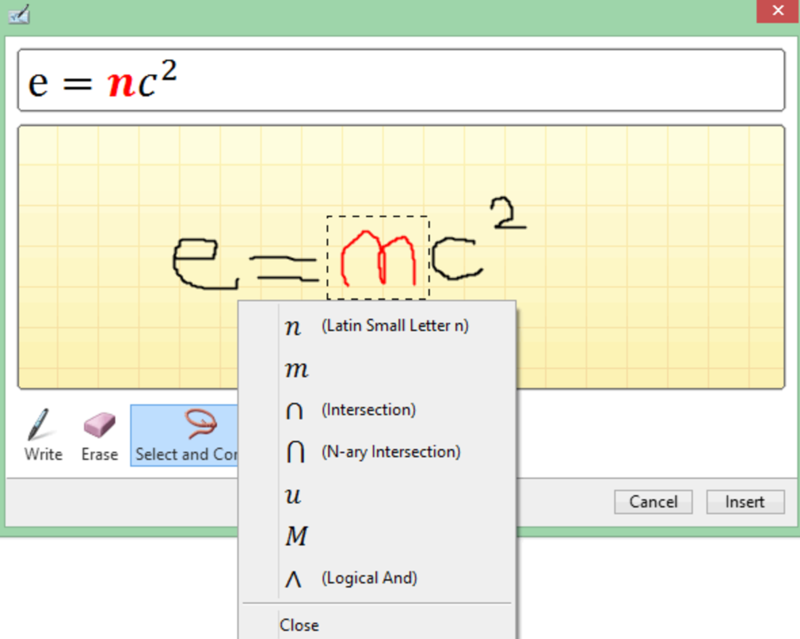 This new Excel 2016 feature is able to convert your handwritten mathematical statements/equations into text that can be included into your documents. This can be done using either the mouse, a digital or light pen, or even your fingers to write the mathematical expressions. 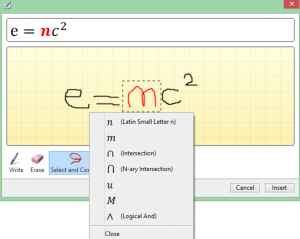 To use this feature select Insert > Symbols > Equation > then click Ink Equation from the drop-down menu. A Preview chalkboard box will appear with writing tools so that you can any additional edits. This is available in most of the 2016 MS Office programs, and is used to easily access information from various resources such as Wikipedia, a dictionary and other online sources. To use it, simply place your cursor on any word or highlight a phrase on a spreadsheet and right click. A panel will open with the appropriate information. This concludes the tutorial on Microsoft Excel 2016. If you are unable to find the information you are looking for, please visit Microsoft’s Excel home page.